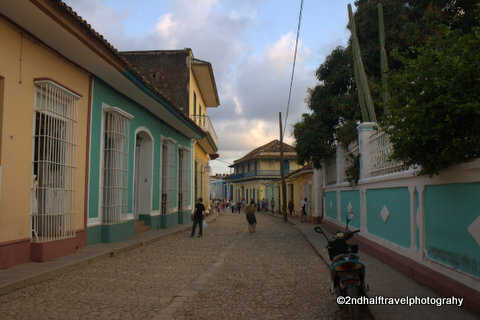 Trinidad, Cuba, is one of the oldest cities in the Americas. That made taking the tour offered by Viking Cruise Lines one of our priorities. 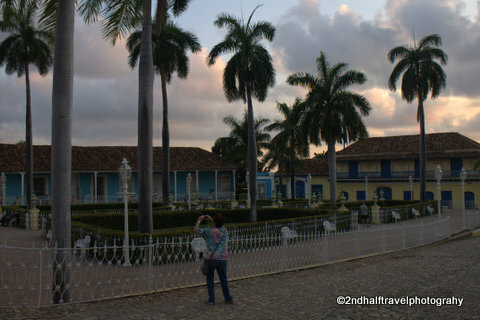 So, our first afternoon in Cuba, shortly after arriving at the Bahía de Cienfuegos, we boarded the tenders and then transferred to the buses for the two-hour ride to this beautiful old city. 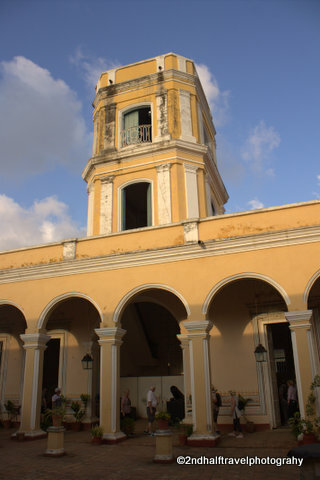 The city of Trinidad was founded in 1514 by Diego Velázquez de Cúellar, a Spanish conquistador. It was built about two miles in from the coast, to help protect from pirate raids. 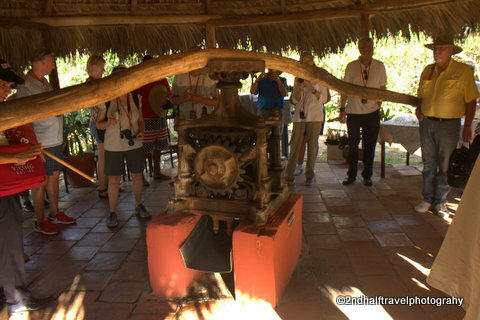 It quickly became the center of sugar trade for Cuba. 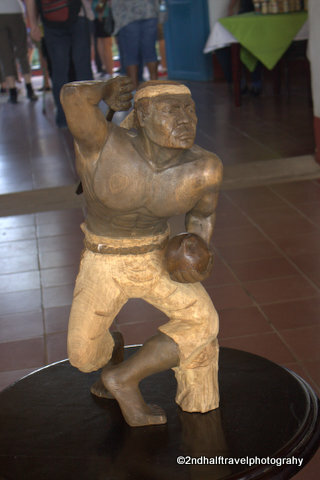 By the late 1700’s the surrounding Valle de los Ingenios (Valley of the Sugar Mills) was home to tens of thousands of acres of sugar plantations, fifty sugar mills and over 30,000 enslaved Africans. 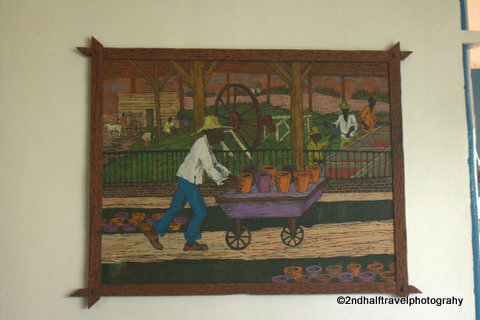 Trinidad was home to the plantation owners and those whose work benefited from the industry. There was a lot of wealth in the city by that time and the owners of the plantations built many fine houses for their families. 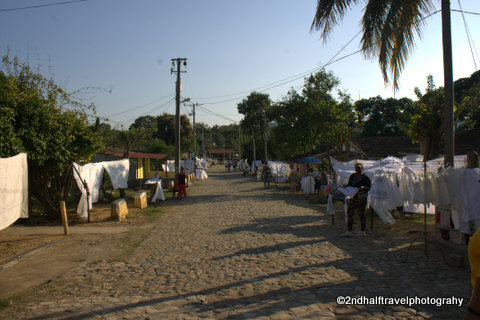 Our first stop was at Manaca Iznaga, a former sugar plantation just northeast of Trinidad. The bus dropped us off along the main road and we walked about 150 m up the hill to the main house. 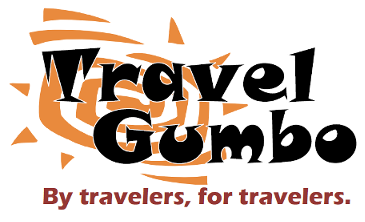 We received our first experience with Trinidad’s cobblestone street. These are not the well fitted blocks that you see in New York or Europe, here they used the stones that had served as ballast in ships coming from Europe. So, you have rounded stones of random shape and size, making walking on them somewhat difficult. We also ran a gauntlet of vendors, mostly selling embroidered table cloths and runners. 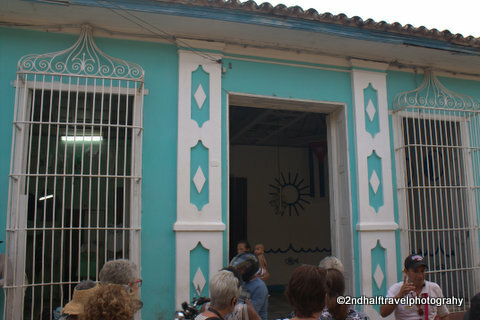 This was the only place in Cuba that we encountered really aggressive vendors. The plantation house has been restored, and today serves as a restaurant. In back of the house an old sugar mill that has been placed much closer to the building than it would have been in real life. The highlight of the visit is the Macana Tower. At 145 feet tall this structure served as a watch tower for fires and escaped slaves. Its bell announced the start and end of the work day. It also demonstrated the wealth of the Macana family. 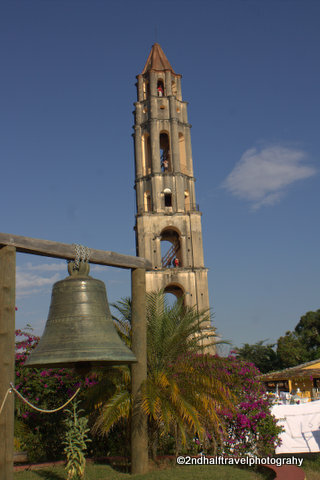 Today, you can climb to the top of the tower and get a sweeping view of the valley. Our bus then took us to the center of Trinidad. The streets here were similar to those at Macana, with uneven stones and very small sidewalks. We walked, first, to the Palacio Cantero. 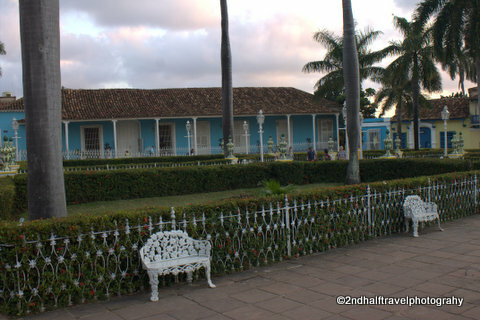 This mansion was built as the home of Justo German Cantero a doctor who lived in Trinidad during the 19th century. 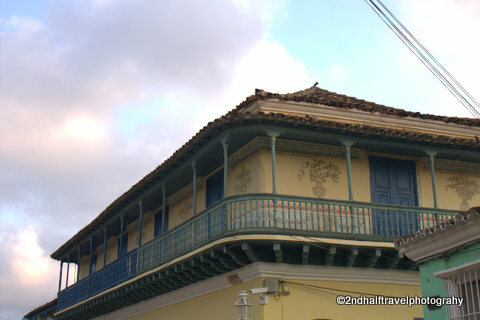 Today the building serves as the Municipal Museum of Trinidad, and has been restored and still contains many of the family’s original decorations and furniture. 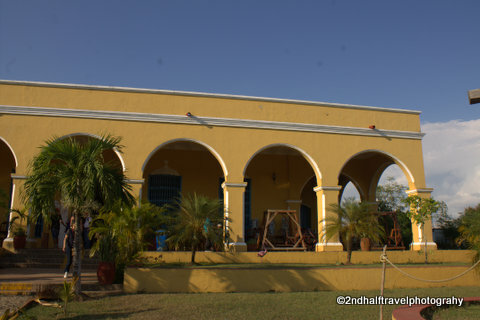 It was designed in classic Spanish colonial style, with the living quarters built around a large courtyard. One of the interesting design features is the kitchen, which is basically a large space that opens fully to the center of courtyard. 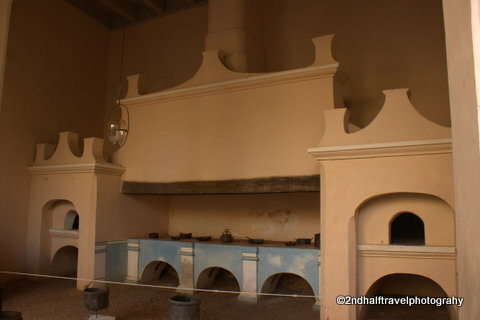 It included a large stove and chimney space for cooking over an open fire. The decoration raised some interesting questions in our group. 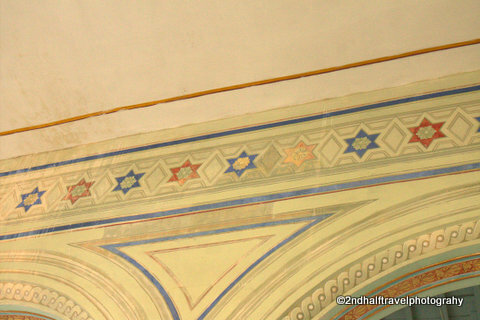 The ceiling is bordered with a row of Stars of David, which led us to wonder if the Cantero family were conversos, Jews who had been force to convert to Catholicism in order to remain in Spain. 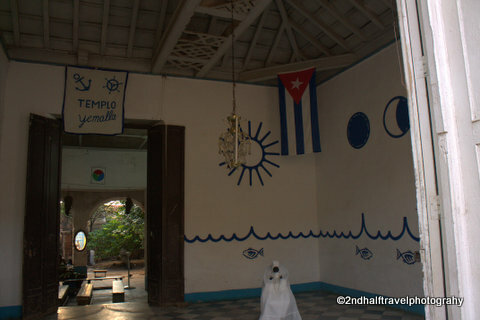 Next, we walked to the Casa de Yemayá, a Santeria temple. Yemayá is the goddess of rivers, and her colors are blue and white. While we were not allowed into the temple, photography from the street was okay. 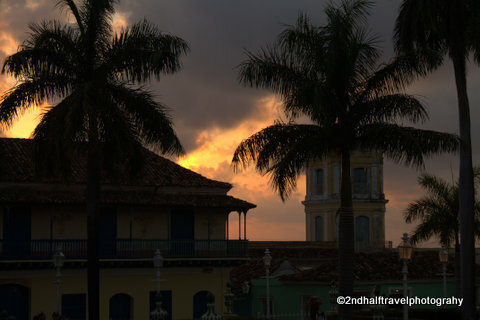 A block away is the Plaza Mayor, Trinidad’s main square. 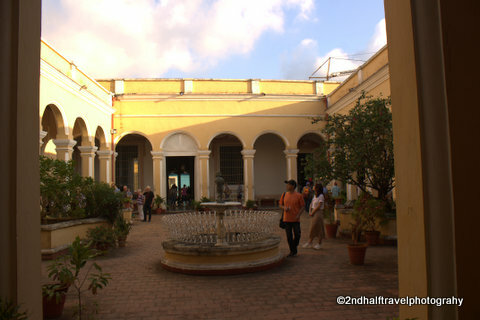 This well-maintained plaza is divided into four raised gardens with paths and benches in between. The park is surrounded by buildings constructed in the 18th century. Most of these were homes for Trinidad’s wealthiest residents. Today they house museums and restaurants. 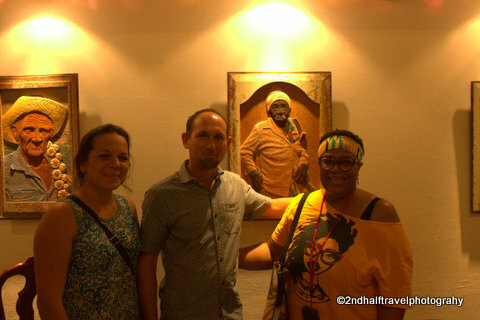 Our last stop was at the studio of Lazaro Niebla. 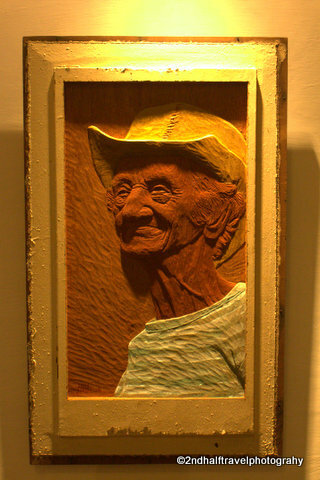 Lazaro is an artist who turns his own photographs of local campasinos into beautiful wood carvings. 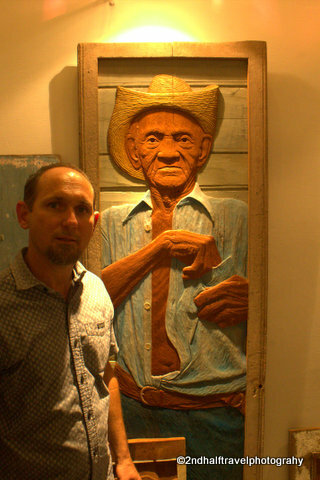 We had the opportunity to meet Lazaro, and hear him describe his process. Our tour ended at Vista Gourmet restaurant. This establishment sit at the top of a fairly steep hill, but its 2nd floor space has great views of the city at night. 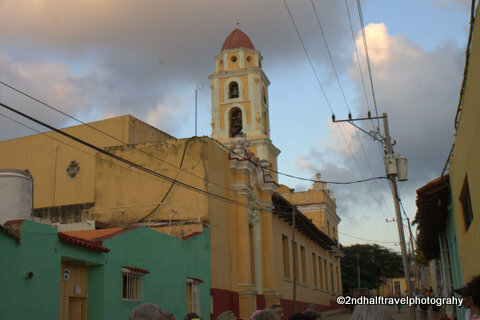 After dinner it was back to the bus, and the drive back to Cienfuegos. This was a long and physically demanding trip, but seeing Trinidad was worth it. Jonathan - Did you get a chance to taste the sugar cane ? There are some wonderful old railway lines serving the plantations with ancient rolling stock to be admired. I'll be back soon to take more pix. 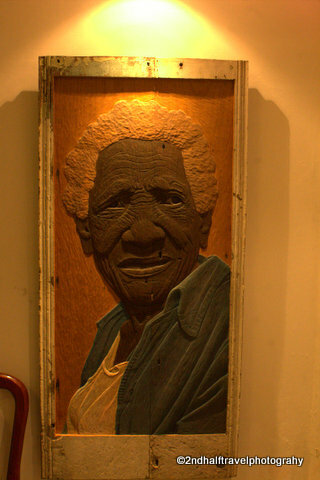 I did not taste the cane on this trip, although I grew up with fresh cane for sale.at.corner bodega in NYC. I knew about the trains from a episode of "globetrekkers" on PBS, and would love to take it the next time I get here.